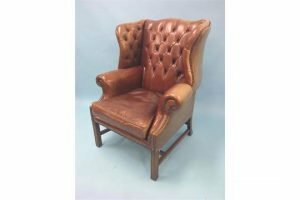 A Bevan Funnell ‘Reprodux’ wing armchair, upholstered in a mellow buttoned brown leather, on a moulded mahogany frame. 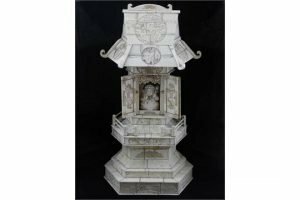 A 19th century ivory pagoda, having carved sloping roof above fenced terrace and two doors revealing seated Buddha, raised on a hexagonal stepped base, decorated with a continuous design of flowers and fauna. 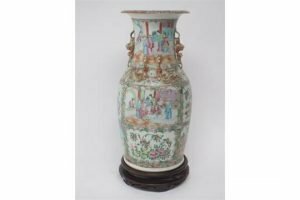 A Canton Famille Rose decorated vase, depicting panels of domesticity between panels of flowers, birds, and butterflies, with applied chilong handles. 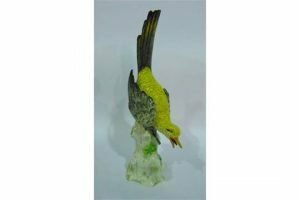 A 19th century continental model of a bird, with yellow and grey plumage perched on a base in the form of a tree trunk, with under glazed blue cross hatched mark to base. 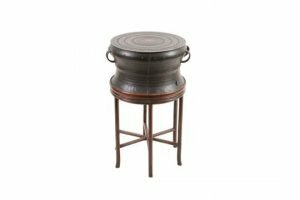 A South East Asian bronze rain drum, cast with geometric linear decoration and with four handles, on a wooden stand. 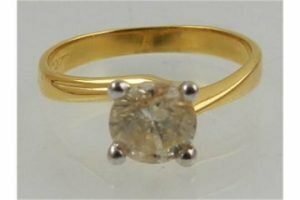 An 18 carat yellow gold and solitaire diamond ring, the round cut stone of approx. 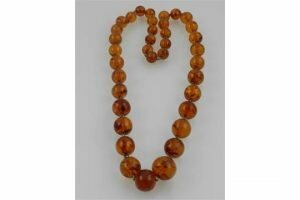 0.90 carats. 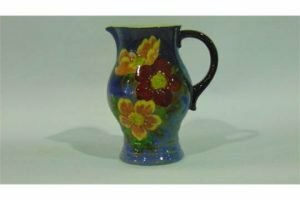 A Royal Doulton jug, with painted red and yellow floral decoration on a mottled blue ground, with printed mark to base. 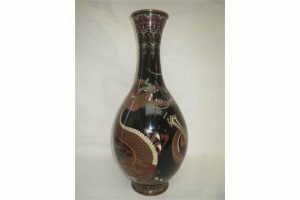 A large Chinese cloisonné baluster shaped vase, decorated with a mythical dragon on black ground. 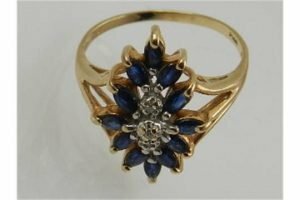 A 10 carat yellow gold, sapphire, and diamond cluster cocktail ring. 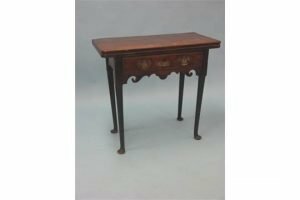 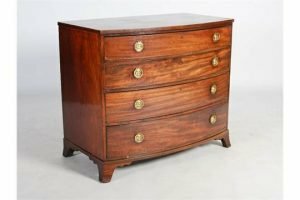 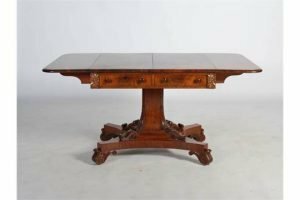 A good quality Victorian walnut writing table, rectangular polished top above two oak-lined frieze drawers, on turned, tapering and fluted legs, oak carcase throughout. 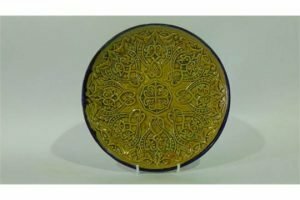 A Doulton Lambeth plate with relief moulding, scrolling and beaded decoration, with ochre coloured glaze and impressed mark to reverse. 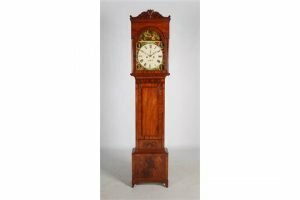 A 19th century long case clock, the enamelled dial with Roman numerals and two subsidiary dials, the twin train four pillar movement striking on gong, enclosed within a rectangular hood with scroll carved surmount, the trunk with rectangular panel door above a rectangular base with bracket feet. 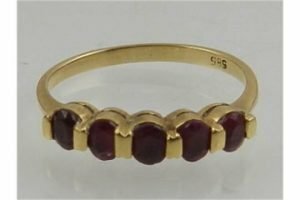 A 14 carat yellow gold and five stone ruby ring. 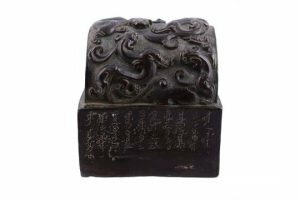 A Chinese bronze seal, with Mongolian and Manchu scripts, with Jiaqing four-character seal, the arched top cast with chilong. 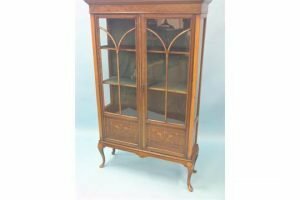 An Edwardian inlaid mahogany display cabinet, pair of astragal-glazed doors enclosing lined interior with two fitted shelves, on cabriole legs. 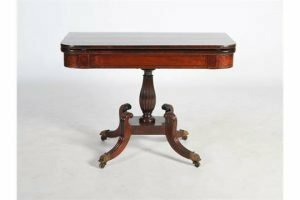 A 19th century mahogany and ebony lined tea table, the hinged rectangular top raised on a reeded baluster column and rectangular platform base, with four down swept supports with fluted detail, terminating in brass toes and casters. 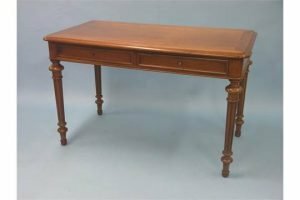 A George II mahogany tea table, rectangular top with re-entrant corners, single, oak-lined frieze drawer above boldly-shaped apron, on turned legs with pad feet.